UNDP Timor-Leste - As part of a two-day field visit to Lautem and Baucau districts, the newly appointed Special Representative of the Secretary General for UNMIT, Ms Ameerah Haq visited the justice institutions in Baucau and met with judges, prosecutors, the public defender and the police. The visit was Ms Haq's first visit to these districts, having arrived in Timor-Leste just a few weeks earlier on 5 January 2010. "I am impressed by the commitment of the magistrates, the public defender, and court officials who I met in Baucau. Access to justice for citizens living in villages and towns across the country depends on the efforts of these committed individuals, and how they are resourced by the Government," said the SRSG adding that the police at the local level also have a key role to play in improving people's access to justice through the way they cooperate with these key actors in the formal justice system. "I believe UNDP's Justice System Programme will continue to play an important role in supporting the development of the justice institutions and improving people's access to justice, in all the judicial districts and at the national level." 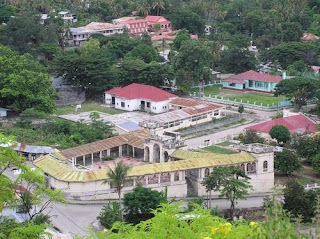 Image added by ETLJB: A view of the old colonial centre of East Timor's second city, Baucau.